Nothing spells the holidays more than a beautifully roasted turkey on the table. The smell. The presentation. And the taste. To brine, or not to brine. There is a lot of discussion about this, and I’ve tried both ways. We always feel brining makes the meat even more moist and flavorful. It truly is The Perfect Turkey. There will be those who will tell you it’s not worth the effort, but we firmly believe it is! 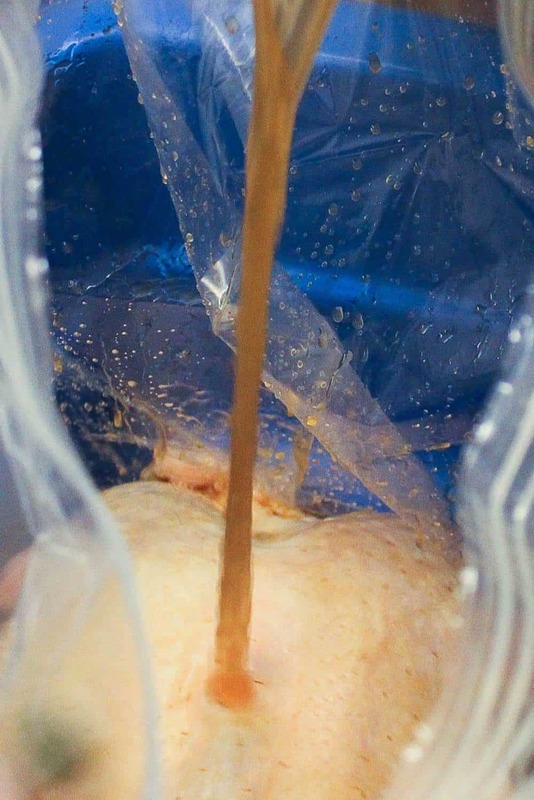 We use a big ole cooler, large brining bags, and either lots of ice, or place the cooler outside, as long as the temperature is nice and cold. 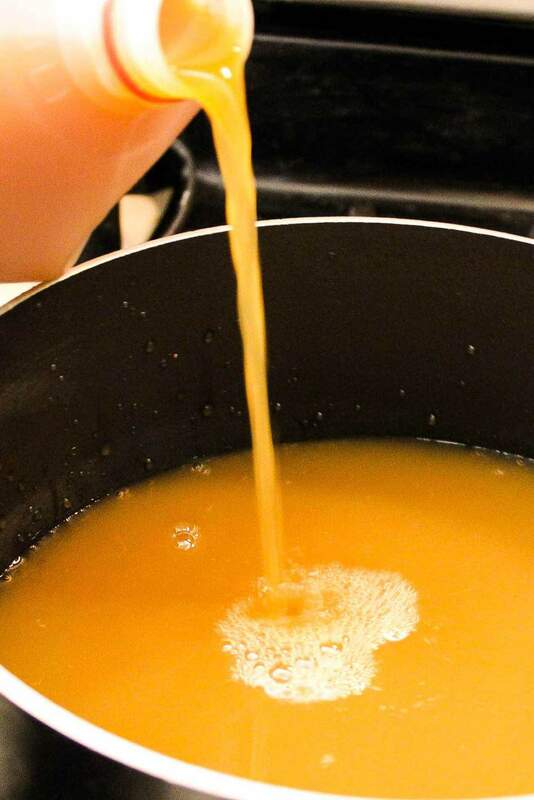 Apple cider is a wonderful ingredient to use for your brine. The salt and other aromatics help make the bird so moist and so flavorful. Simple fresh herbs and citrus will deepen the flavor after they cook inside the cavity of the bird. The smell is truly magnificent. I’ve been tweaking this recipe for about 15 years…and I feel pretty confident to call this The Perfect Turkey. Although, next year…I’ll probably tweak some more, I just can’t help myself. 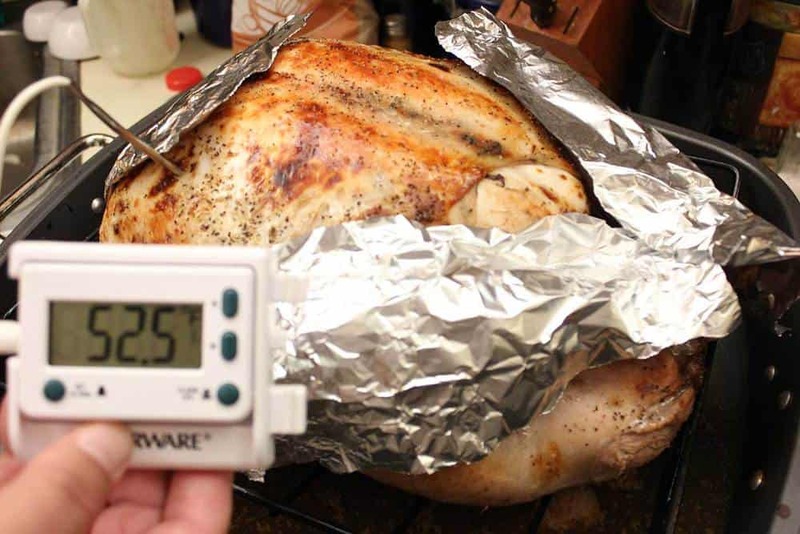 Most important…get an instant-read thermometer that you can insert into the turkey and watch the temp without having to open your oven. This keeps it moist and flavorful! Be sure to tent the breast and legs after the initial roasting. Try and resist opening the oven as much as possible. But do keep an eye on the bird to prevent any of the skin browning too much. I must say…I just made this, and the Loon nearly passed out when he took his first bite (which happens every year). I’m a big believer in brining…it deepens the flavor of the meat, and makes it buttery tender. Oh my. You will be so thankful. The perfect Thanksgiving feast takes time and pre-planning. It is wonderful with my Thanksgiving Dressing. Start thinking about this now. Write down the time schedule. And you’ll be perfect. As perfect as this Perfect Turkey. 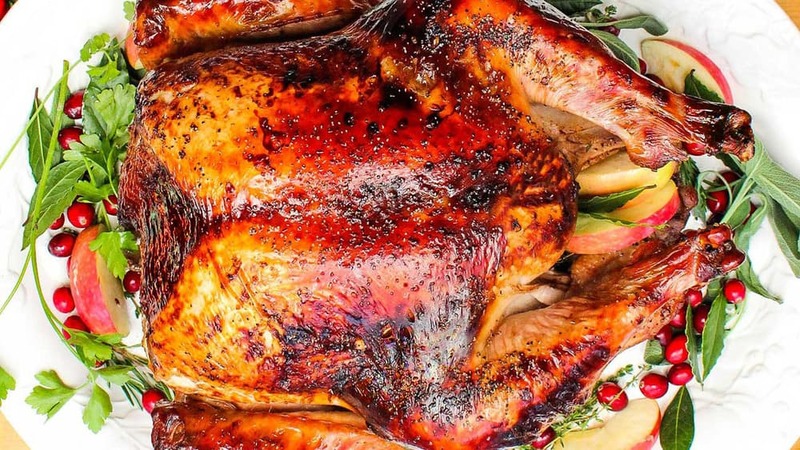 This Perfect Turkey recipe is fool-proof. The key here is brining (you can find a brine bag at your supermarket)...and an instant-read thermometer. No guessing...once the inner meat hit 160 F...you're good to go. Just get started a couple days before you want to serve...and you'll be golden...just like this turkey. You're guests will flip. In a large stock pan, simmer 4 cups of the apple cider, Kosher salt, allspice and bay leaves. Simmer for about 15 minutes, stirring often. Add the remaining 3 quarts of cider and another gallon (4 quarts) of water. Place turkey into a large brine bag and then put in a large cooler. Now...gently add the cooled brine. Either place in the fridge, or cover the brine bag in the cooler with ice...and let rest for 24 hours. Remove the turkey from the bag, and let drain in your sink. Rub canola oil (or butter) all over the turkey...about 1/4 cup. Lightly salt and pepper the skin (not too much...it's already soaked in salt from the brine). 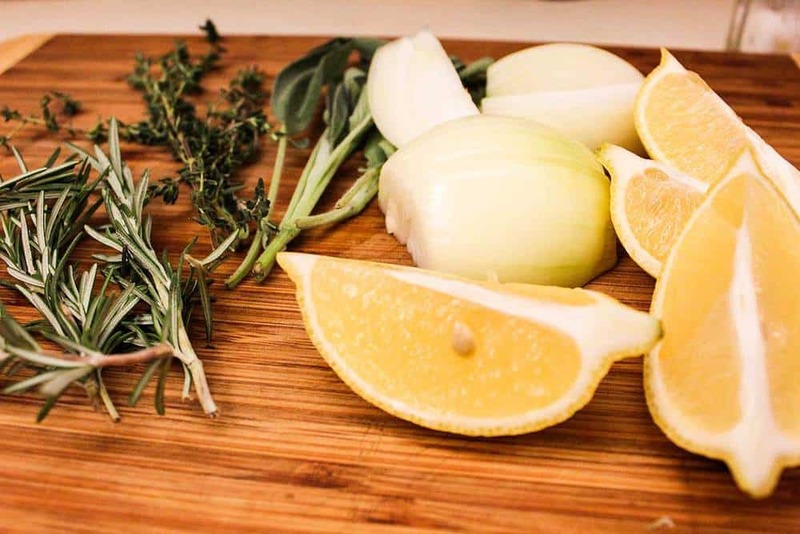 Stuff the cavity with quartered onions and lemons, as well as the aromatics: thyme, rosemary and sage. Place on a roasting rack in a large roasting pan, breast side up. Insert the instant-read thermometer into the thickest part of the breast. Add the chicken stock to the pan (use the drippings for gravy, later). Place in the oven and bake on high for 30 minutes. Leave the thermometer temperature display on the outside of the oven, so you can keep an eye on the temp. After the 30 minutes, remove the turkey from the oven and reduce the heat to 350. 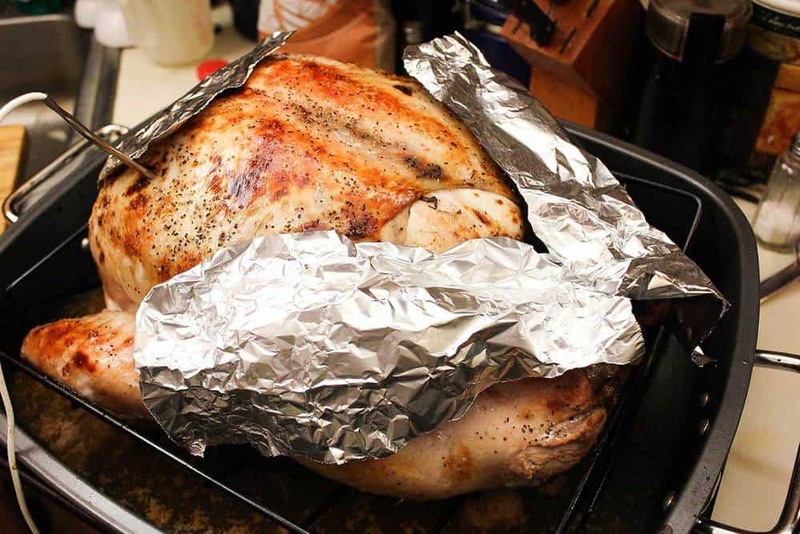 Add pieces of foil over the parts of the bird that have turned dark: wings, sides, etc. Now, return the turkey to the oven, and cook until the internal temp reaches 161° F...about 2 1/2 hours for an 18 - 20 lb bird. Remove from oven...carve. And be in heaven. Just found your site and I love it already. My question to you is do you use a store bought turkey, which I think is always pre-brined, for this method? Thank you so much for this recipe. I had not cooked a turkey in about 20 years and was a bit rusty. 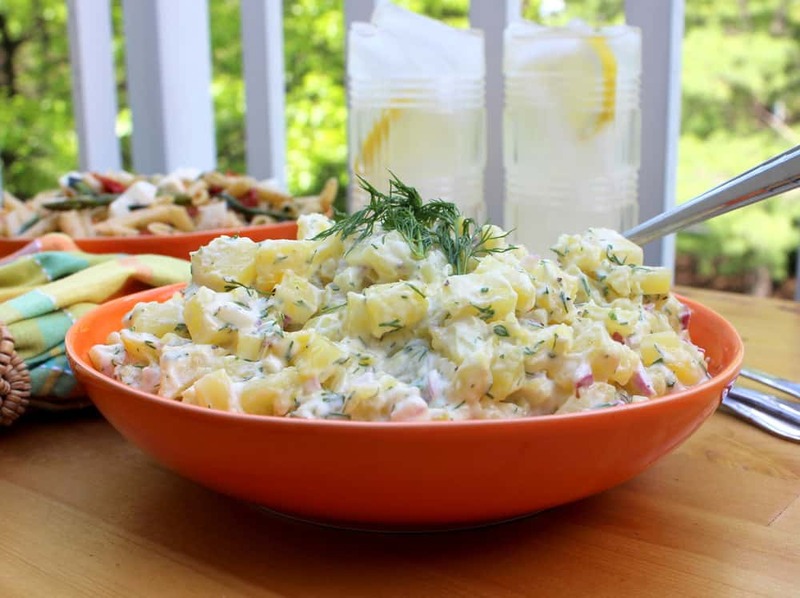 This recipe was very easy to follow and so amazing! Everyone at Thanksgiving raved about how delicious and moist the turkey was. It was a hit! Thank you so much for this recipe. I had not cooked a turkey in about 20 years and was a bit rusty. This recipe was very easy to follow and so amazing! Everyone at Thanksgiving raved about how delicious and moist the turkey was. I am first time turkey maker with a firefighter husband and I wanted to get this perfect. I love your other recipes and know this is going to come out perfect but I wanted to get any ideas about putting the bird in a roaster to ensure it’s cooked throughout after the 500 degree setting. What do you think? And how would that work? Hi Bree! I would definitely recommend using an Insta-read thermometer that you can insert to the thickest part of the bird, and keep the reader part of the thermometer on the outside. I’ve not cooked a turkey in a roaster, but my mother has to great success. The quick 500° setting just helps to create a quick crispness on the skin and lock in juices. Keep an eye on the skin to make sure it’s not browning too quickly. Although I am a big believer of brining — I have now switched to “Dry Brining” ala J. Kenji-Lopez Alt (The Food Lab), “Meathead” Goldman (Amazing Ribs) and others. Have you guys tried that approach? I have and I will admit it’s just as juicy etc. as a wet brine and maybe 10% of the work. We LOVE spatchcocking, and in fact..that’s what we’re doing this Thanksgiving! Dry brining is wonderful, too. As is a deep-fried turkey! That’s what’s so great with Thanksgiving, there are multiple ways to make classic dishes, and almost always…they are absolutely divine! You both are such a pleasure to watch and your videos are fantastic! 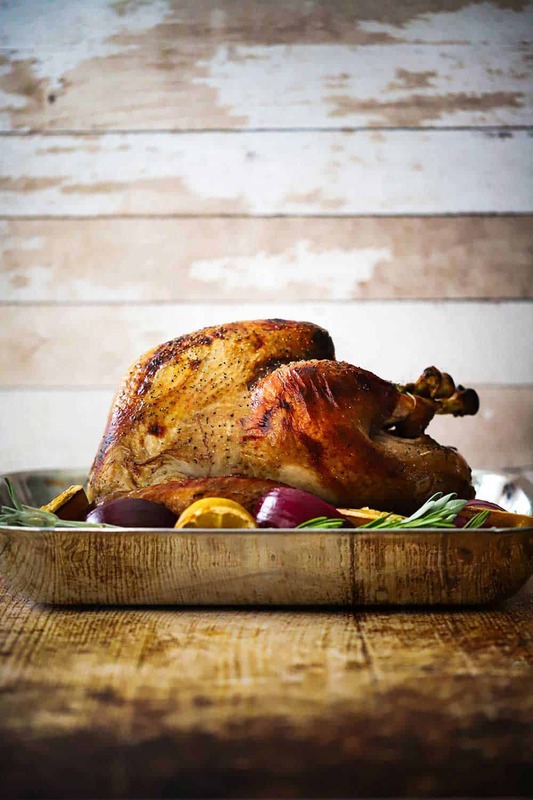 Thank you for this gorgeous brined and roasted turkey recipe! It looks quite easy and certainly delicious!! 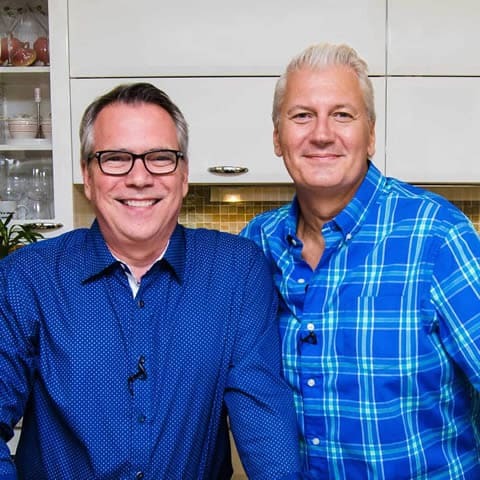 I keep most all of your recipes I receive in my email and am always happy to get a new one from you! Thank you so much Cheryl!!! Have an absolutely wonderful and delicious Thanksgiving! Fabulous looking turkey! Will have to give brining a try. Thanks for sharing! Cheers to you and your Loon! Hi Betsy! 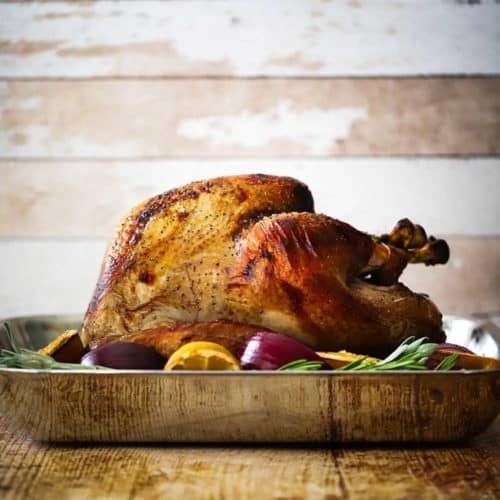 Absolutely, instead of stuffing with the lemon, onion and aromatics….just stuff it with your stuffing…but I would let it cook for another 15 – 20 minutes to ensure the inner most part to the bird if fully cooked. It’s delicious, we’ve done it both ways. Happy Turkey Day!! Looks great. Just for clarity, what type (brand) of Kosher salt for brining? When measuring by volume as you do, it makes a difference in the total sodium levels. Hi Mitch, Thanks! I use Morton’s Coarse Kosher. Makes for a super moist turkey, but not too salty at all.